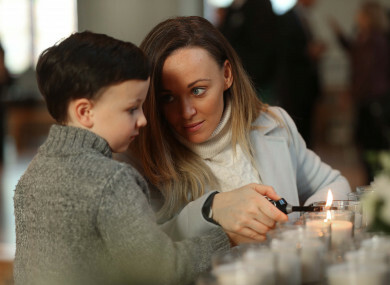 Lisa Marie Maher and her son Harry Foy (5) light a candle in remembrance of Harry's grandfather Eugene Maher. TODAY, EVENTS WILL take place across the country in honour of all the lives lost on our roads. At the event in Mullingar, a ceremony will be held where white doves and balloons will be released by the lake at Bloomfield House Hotel. Families and members of the emergency services will release them, and red roses will be floated on the lake in memory of all of the lives lost or affected by tragedies on our roads. Donna Price of the Irish Road Victims Association says that around 400 families will attend, and it’s an emotional event. Together we remember our lost loved ones, we put their photos on a table to see the faces of the victims in those white photo frames is powerful. It’s poignant. “The devastation in the room is palpable… but there is some weird comfort and consolation in coming together and knowing that you’re not on your own. Donna’s own son was killed on Irish roads in 2006 as he was driving to college in Athlone. Now, she’s an advocate for the families of victims like her son, and speaks on issues on how to keep roads safe. At a ceremony held in Dublin on Thursday to honour victim’s memories, Donna told TheJournal.ie that people had gathered to remember their loved ones, but also to raise awareness of road safety. I suppose numbers mean nothing to people. But when they see the real people behind those numbers, I think it helps to hit home and realise how easy this devastation can reach any families – I didn’t think it would reach my door. Drogheda native Michael O’Neill lost his 21-year-old daughter Fiona in November 2001 when her and her boyfriend Damien were killed on their way to the airport, about to travel to Australia. In 2011, on the 10th anniversary of her death, he heard about a World Remembrance Day for the victims of road traffic collisions and their families, and looked for details on the event in Ireland. But the Road Safety Authority didn’t know of one, and neither did the gardaí. So he set one up himself to honour his daughter’s memory. Now, six years later, the event has spread to every corner of the country. He says that events like these help families offer advice to one another, and to comfort each other through their pain and grief. Chief Superintendent Finbarr Murphy said that the devastation road incidents have on members of the gardaí is significant – almost every garda attends the scene of a traffic collision. If they don’t they’re part of a lucky few. He says that no matter what kind of road user you are, that you should ensure you get home as safely as possible, and to take responsibility for your actions. If you’d like to get involved, you can find more information at the Irish Road Victims Association: www.irva.ie, or email: irva@eircom.net. Email “'The devastation in the room is palpable': Events held nationwide in memory of road traffic victims”. Feedback on “'The devastation in the room is palpable': Events held nationwide in memory of road traffic victims”.